Is it any surprise that a 1976 Narcissus queen and former Aloha Airlines flight attendant would end up on the cover of a magazine in 2015? 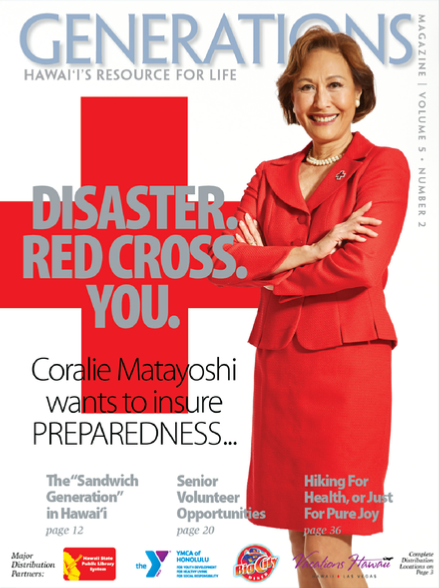 The story focuses upon the fact that, “at every flash flood, tsunami, earthquake, or house fire across our state, Red Cross volunteers are providing disaster relief to people in need.” It’s a mission that got Coralie’s attention years ago. 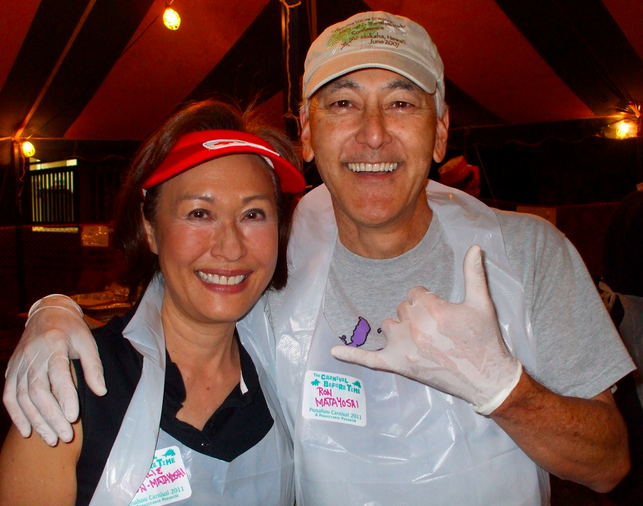 Coarlie and husband Ron happy at work in the Punahou74 malasada tent at the 2011Punahou Carnival. After briefly working in a Honolulu law firm she later became the Executive Director of the Hawaii State Bar Association. 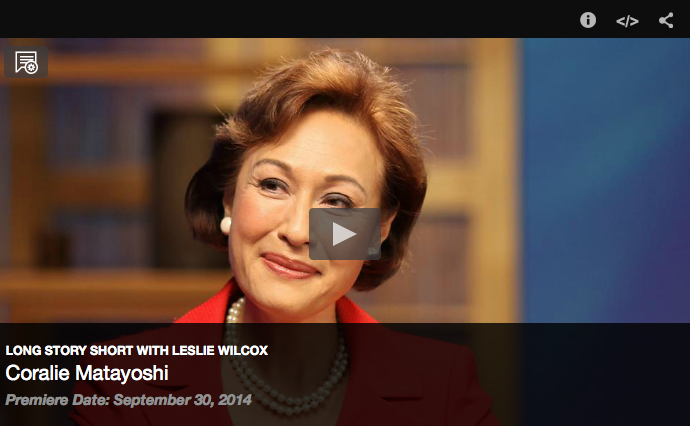 After serving there for thirteen years, she moved on to become CEO of the American Red Cross in Hawaii in 2003. While legal work helped people, the Red Cross mission offered a way to directly help people in need. In Hawaii alone, about 300,000 volunteer hours are given in this altruistic pursuit every year–including hours from thirty-five therapy dogs. Perhaps it is appropriate that Coralie walks the walk when it comes to volunteering herself. During her “free” time she can be found serving with the University of Hawaii Board of Regents (one of her alma matres) and the Diamond Head Theater Community Advisory Board. 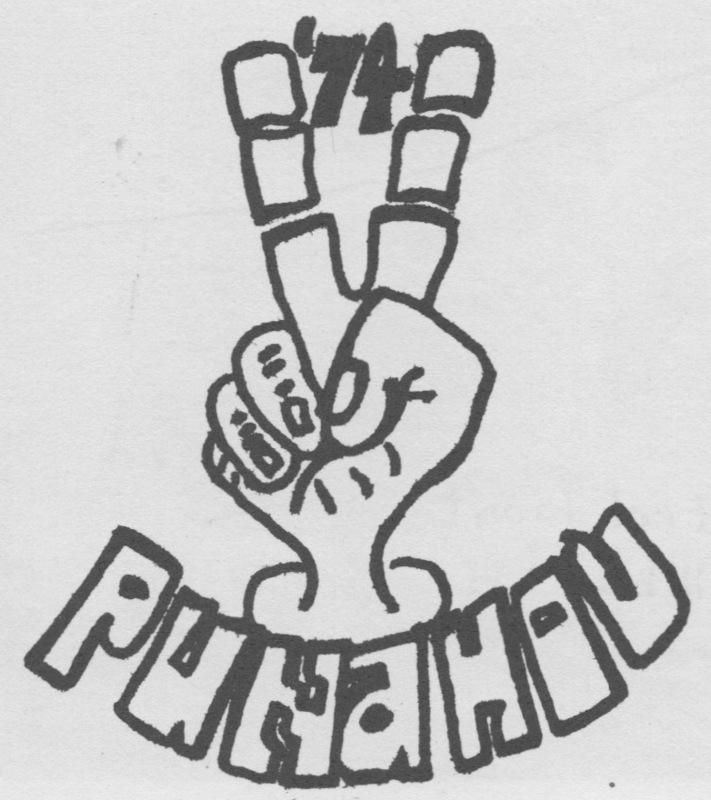 Other efforts have included community boards and committees, the Hastings College of the Law Alumni Board of Governors, the Aloha United Way and numerous other endeavors … including regular attendance at the annual Punahou74 Punahou Carnival malasada shift. When looking at the magazine cover, my eyes zeroed in on Coralie’s suit. The red I expected. After all, she heads the RED cross. But I wondered where she got got that suit. Red, after all, isn’t the easiest suit color to find. A lot of my best red suits have come from the Punahou Carnival white elephant. Because people buy these red suits, and they think, Wow, it’s so nice. And then, they think, Mm, it’s kind of, you know, racy. But of course, it’s Red Cross; I need those red suits. … But a lot of people compliment me on my clothes. And really, if I spend twenty dollars on a dress, that’s a lot. Great interview, Coralie. So nice to see your life of service! And I do remember how kind you and your parents were to me when we were at Lincoln School. Great memories!